Pleasant stay, friendly, helpful staff, comfortable room. Nice hotel a little tired in places but clean and the Staff are friendly, very quiet, only two other guests, so cant really be accurate about service, bedroom ok comfy bed, nice fresh bedding, room felt a little cold when we first arrived but ok later, bathroom was a little on the small side, but thats the nature of this very old building, en suites sometimes just dont fit..Food ok presentation of starter a little off...It was New years day when we stayed a little surprised that the restaurant was open just for us! 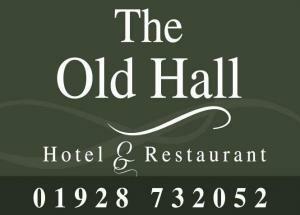 We've stayed at the Old Hall on many occasions for family functions. It's a warm and friendly place with an excellent menu over recent years. We booked under the old guard and were surprised that it had changed hands. The jury is still out:it was very obvious that the new team were still settling in - very proud of their small chain and ready to make changes. I hope they retain the friendly team atmosphere and small touches including milk in the bedrooms for tea and coffee (and reinstate the biscuits)! A lovely hotel with excellent food and service. Particularly appreciated the parking slot and real fires! Overall very pleased with my experience at the Old Hall. Very friendly service, great breakfast / included. My room was clean and comfortable. The shower coukd’ve Been more powerful. Furnishings a little tired. Good room and nice hotel, where you can walk around the village in the evening. Our stay was great - friendly staff, good food, nice pub. Could use some updating in the rooms. Very gracious, clean rooms, good food, well located. Lovely location and historic setting We felt very welcome Thanks. Dated hotel but room was very comfortable with large modern bathroom. Staff were excellent and very welcoming. We enjoyed our evening meal and freshly cooked breakfast.Cosy bar with plenty of seating. Good value and location for train station. Excellent stay. Comfortable room. Good buffet for the party and nice breakfast following morning. Good service. Thank you. This was a wonderful stay in a charming, hospitable lovely hotel. Many local shops within walking distance and a good choice of local restaurants (including the Old Hall Hotel) within a 2-5 mile driving range,Thanks to the staff for their wonderful service.Oh and the breakfast marvelous. Loved our stay at this quaint traditional hotel. Room was clean, bed comfortable, staff friendly and courteous and breakfast delicious. Loved the open fire and the local ale. Would certainly stay here again . Many thanks. A pleasant hotel of character handy for Chester and the Wirral. The staff were friendly and helpful and the rooms very clean with powerful showers. We had 3 rooms, one at the front of the hotel, one at the back and one in the annex, where pets are allowed. All 3 were individual and all, including the annex , had tv and coffee and tea. Free wi-fi is available but my device could not find it. Would recommend. I last stayed here 25 years ago. Still the same standards of food and Service, Very good.. In the last 6 weeks I have visited the Runcorn area 4 times. My previous visits to other big chain hotels were on average OK. On my fourth visit, I remembered staying in a hotel called the 'The Old Hall' in Frodsham about 25 to 30 years ago &remembered it being pretty good. I booked a room at about 80% the price of the other hotels but this time breakfast was included in the price, so really about 75% of the price of the other hotels.My room was much bigger than the other 3 hotels that I had stayed in my previous visits. The bathroom alone was about the same size as the bedroom of my previous hotel. There was a bath &a shower. My room (number 23) had a big comfortable bed, a large leather settee, gigantic flat screen TV, Tea &Coffee &free internet (which did not require a PhD in IT to get connected). Everything was very, very clean. The lady that checked me in was very friendly. Every time I visited reception I got perfect service. Upon leaving my room in the morning, I got a big friendly smile from the chamber maid who gave me directions, how to leave.The hotel was built in the 16th century and perhaps some might think in a bit of a time warp. For me this is charming. When you check in, you sign 'The Visitors Book' &not asked to sign some computer printed form.I did not eat in this hotel as I love Indian food and 30 seconds walk away was an Indian restaurant with very good reviews. There are about 12 other restaurants/bars within minutes walk of this hotel.For me, this is a good old fashioned hotel run in an old fashioned way with people that really care, instead of robotic staff with artificial plastic smiles who are programed to say 'Enjoy your day'.On my next visit, I will be staying here again &advise my customer that their other visitors would probably enjoy this hotel. Very nice hotel and excellent food.lovely welcoming staff. (Didn't like pillows. )Highly recommend. Very new to this hotel;and I have already booked to go back! What more can I say? We had a great weekend away.The Hotel was fantastic.The staff were friendly and our room was clean and great. Although du to circumstances beyond their control(boiler failure) I did not stay there but the Hotel kindly sorted an alternative hotel for me and paid the difference in price! Great service and lovely staff! Enjoyed morning coffee in cosy lounge. Our room was spacious and attractive and the en-suite positively palatial ! Excellent breakfast too. Can heartily recommend this hotel. Stayed several times,love the old world charm and quiet calm atmosphere.Both the evening meal and breakfast were good.Maybe not for anyone who prefers bland faceless modern hotel chains but I wouldn't stop anywhere else. The Old Hall is a fantastic location. The site offers great food, great local and historic setting. You may loose a few of the amenities of a larger hotel but it's wort it for the pure charm. I had a large room which was clean and comfortable, if a little chilly. The bar food was excellent, as was the breakfast. I would definetely stay here again. very clean good atmosphere. Helpful staff. Room spacious and elegant with satisfactory bathroom en suite, in old part of the hotel (recommended) and most staff friendly.We have stayed at The Old Hall before and enjoyed it. Nice welcoming open fire downstairs on a cold February day. Evening meal this time too - well prepared, tasty and good service. Breakfast also very good. Minor quibble:at check-out mentioned that the second shower (mine!) ran cold and that thick dust &cobwebs nestled on old bathroom ceiling beam only really visible when standing in the bath/shower. Duty receptionist only mildly interested and not apologetic so next occupant of Room 5 will no doubt find the same. I will check next visit! Booked last minute via online system on arrival was told that the hotel was full, but this was very quickly rectified by the friendly reception staff.Our room was very clean and my only complaint if I could find any is that the boiler was a little noisy but other than that, the bed was extremely comfortable and extra pillows were provided.We had the Valentine's Day meal in the restaurant which I can only describe as amazing, extremely tasty and well cooked, as was the breakfast the following day, I found the staff to be friendly and courteous, the hotel is close to Cheshire oaks and Chester, we had a great weekend, thanks. Stayed here two nights this week. Friendly staff and lovely log fire ! Comfy bed and lovely breakfast! Our bar meal was very good too 😊Friendly staff. Cosy and festively decorated.🎄Enjoyed our 2 night stay. Set in a convenient spot in the town of Frodsham, the hotel is easy to find again as it is set on the main road, near all you would need. I enjoyed the roasting fire and good bar food, as well as my comfortable room. Staff were welcoming. All in all this gave me a great place to rest en route, and I will use it again when I am up this way. This hotel has a nice atmosphere and the staff are helpful. The disabled parking is a bit of a hike away, there is no safe available for valuables and the early morning call did not materialise but the room and bed were extremely comfortable and the restaurant, perfectly adequate with a good menu. We enjoyed our stay and would return. I am a regular visitor to The Old Hall in Frodsham and am happy to return again in the future. OK, the place isn't the plushest hotel in the world, but I happen to like rustic charm, squeeky floorboards, irregular shaped rooms and the odd beam here and there. The bar area is cosy serving a good array of beers and wines, plus the food in the restaurant is of a high quality. Don't forget to have the breakfast. For quality and the variety on offer, one of the best. It will certainly keep even the mightiest appetite going for hours. All in all, my first choice when I am staying in the Runcorn area. The Old Hall hotel is full of character. We stayed in the main part of the hotel. The room was clean and just what we needed as we were in Frodsham for a wedding.Breakfast was very good and plentiful, please do not take this as a criticism as we didn't realise at first that there was fruit juice, cereals etc in the other room may be the waitress could mention this to guests. easy to find hotel - good room and comfy bed, nice to have individually cooked breakfast in morning. Would stay again. I had the option to stay at the holiday inn and was advised to stay at the Old Hall. It was some of the best advise I've ever had. It's a charming English Inn with comfotable beds and one of the most polite staffs I've ever had the pleasure of dealing with. The food is exceptional!! If you looking for an ultra modern hotel this is not it. If you want a stay with character and great service and top notch food this is the place for. To top it off Frodsham is a fantastic little town!I will be back again. Lovely room, excellent meal and friendly staff. Good hotel, friendly stuff, suitable room, fine weather, fine food (espeсialy porridge). It will be better if there will be a freezer in the room. Excellent staff &service, really enjoyed our stay. Good food, comfortable room and friendly service.Overall very pleasant experience. an excelent old world hotel, retaining much of its original features,very clean roomstaff very helpful, great food. Thank you for your review Mr Lange, we look forward to seeing you again in the future.